After a relatively short two-year holding period and some unexpectedly rapid share price gains, I have decided to sell Victrex. In this blog post I’ll outline why I bought Victrex, what happened during its brief two-year holding period, and why I’ve decided to sell now. Victrex joined my model portfolio in 2016 as a highly successful, fast growing company which was facing some headwinds. It was and is the world leader in high performance PEEK-based polymer solutions, where PEEK (a type of advanced plastic) is used as a superior alternative to metals and other plastics in a variety of industries including automotive (e.g. lightweight gears), aerospace (e.g. lightweight brackets) and medical (e.g. spinal implants). The industrial use of PEEK is still in its infancy. Back in 2016 the company had a dividend yield of 3.2% and a PE ratio of almost 15. Those aren’t exactly bargain basement numbers, but with a ten-year growth rate of almost 15% and a dividend yield of 3.2%, Victrex was attractively priced relative to similarly fast growing companies. The headwinds faced by Victrex appeared to be short-term, so I added it to the portfolio on the assumption that the company would recover at some point. From day one, the investment worked out better than I expected. Victrex quickly returned to growth, raising its dividend by 15% in 2017 and 10% in its 2018 interim results. Mr Market fell back in love with Victrex and the share price shot up by more than 100%. I’m selling now to reinvest in more attractively valued companies. You can read the full pre-purchase review of Victrex (in PDF format), which was originally published in the August 2016 issue of my monthly investment newsletter. When Victrex joined the model portfolio in 2016, there were some signs that its high growth days were behind it. For example, in its 2015 annual results the company only managed to grow revenues, earnings and dividends per share by 4% each. That was a far cry from the consistent double digit growth rates Mr Market had become accustomed to. In fact, Mr Market was so disappointed he pushed the share price down almost 40% between the start of 2015 and the start of 2016. But Mr Market doesn’t think about the long-term, so the combination of slower growth in 2015, plus headwinds in Victrex’s Oil & Gas and Medical markets (oil prices halved in 2015 so oil & gas companies were short on cash, and the number of US spinal fusion surgeries had been flat since 2011) were enough to drive optimism out of the share price. Management, on the other hand, expected these headwinds to be short-lived. 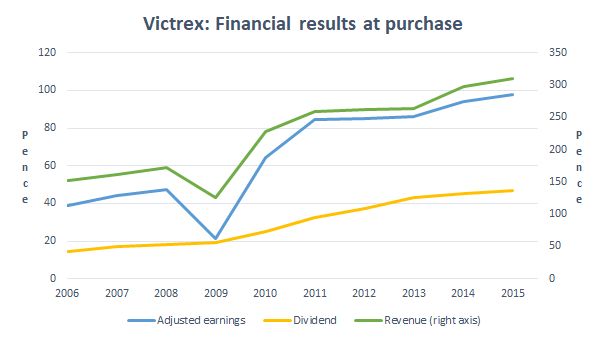 And thanks to those share price falls, Victrex’s dividend yield increased to a respectable 3.2% while its PE10 and PD10 ratios (price to ten-year average earnings and dividends) were well-within the levels I’m comfortable with. Looking beyond the company’s impressive long-term growth figures, progressive dividend and reasonable dividend yield, it also had other attractive features. The main one that springs to mind was its ability to produce consistently high post-tax returns on capital employed. 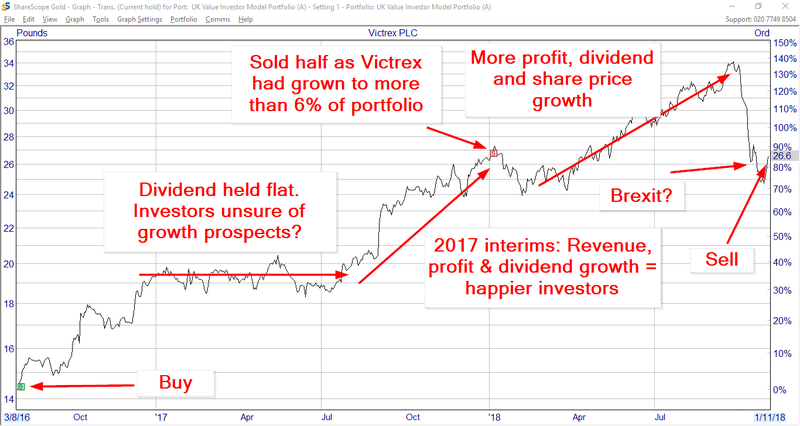 For example, the average FTSE All-Share company manages a return on capital employed of around 10%, while Victrex managed to produce returns of more than 20% in every year bar one from 2006 to 2015. That’s very impressive and it’s good evidence that Victrex has some kind of sustainable competitive advantage (probably from a combination of strong brand, large scale, long experience and numerous patents). Another attractive feature was its strong balance sheet. Although Victrex had a long record of profits and dividend payments, it does sell into highly cyclical markets such as oil & gas and consumer electronics. So it has the potential to be cyclical, and the last thing you want in a cyclical companies is too much debt. In summary then, Victrex appeared to be a good company trading at a reasonable price. It was facing some headwinds, but management thought they would be short-lived and not affect long-term growth, and I thought there was a good chance they were right. I added Victrex to the model portfolio in August 2016, so the first post-purchase annual results were for 2016, published in December that year. When those 2016 annual results came out, they confirmed Mr Market’s fear that Victrex might be going ex-growth. Despite these less than brilliant results, the company’s core markets were still growing and management were optimist (aren’t they always?) about the company’s prospects. Investors were unimpressed and the share price stayed flat for the first half of 2017. Then Victrex published its 2017 interim results and everything changed. The results showed revenues and profits up by more than 10%, with an increase to the dividend of 4%. It seemed as if Victrex’s problems were going to be even more short-lived than I’d hoped. Like clockwork, Mr Market pushed the share price back up again as he mentally extrapolated Victrex’s successful first-half of 2017 into the distant future. In fact, Victrex’s share price went up so quickly it took the investment to more than 6% of the model portfolio’s total value. That’s the point at which I’ll ‘top slice’ an investment in order to lock in those gains and – more importantly – reduce the portfolio’s exposure to that one company. So in January 2018 I sold half of the Victrex position, reducing it back down to about 3% of the portfolio. Next up were the 2017 annual results, which continued the the good news theme by announcing further growth and a special dividend. Shortly afterwards, the 2018 Q1 results showed incredible revenue growth of more than 41%. Mr Market reacted again, at one point taking the price to almost 140% above my original purchase price. 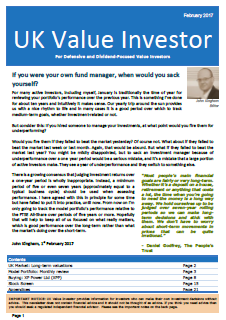 Mr Market is famous for his short-sighted and emotional response to company results and statements about a company’s future prospects. If a company misses a profit target, uses words like ‘headwind’ or ‘tough trading environment’ or, god forbid, cuts its dividend, Mr Market will often fall into a depressed slump and try to offload the company’s shares onto you at knock-down prices. But if the company has a good year or two, perhaps raising the dividend by 10% or 20% per year, then Mr Market will usually want all of the company’s shares for himself, so he’ll offer to buy yours at an unreasonably high price. And now I’m trying to do the opposite of Mr Market again. Victrex has returned to growth in 2017 and 2018 and today Mr Market wants all of Victrex’s shares for himself. And to entice us into selling, he’s offering a high price relative to the company’s historic earnings and dividends. For example, thanks to Mr Market’s elevated price, Victrex’s dividend yield is now down to 2% while its PE10 and PD10 ratios are 33 and 72. As a general rule I’m not happy holdings stocks with yields below 2%, and I don’t like to see PE10 and PD10 ratios above 30 and 60 respectively, either. As a value investor I’m not comfortable owning companies at historically high valuations, or having an enthusiastic Mr Market as a co-owner. I would rather sell to Mr Market today and reinvest the proceeds into another good company that Mr Market is offloading at a low price because of his excessive short-term fears. So that’s why I’ve removed Victrex from the model portfolio and my personal portfolio. As usual, I intend to reinvest the proceeds into a new holding next month. John – Interesting decision and some interesting numbers. Not sure how you get some of the numbers, so I’ll list below what I think (and may be you are measuring them differently) they should be. I bought a chunk of Victrex in October 2016 at 1627 and at the time it’s P/E was around 16 and the dividend yield for 2016 fiscal was approx 3%, similar to what you report. Today the P/E is around 20-21 depending on which side of the earnings guesstimate one choses. The growth rate back then as you pointed out was not much close to nothing or slightly negative. Today the growth rate is 13% and possibly 1% next year depending on who is reading the runes. Puzzled by your assessment of the dividend though as I have it at close to 4.5% for the year to the end of Sept 2018 and projected at 4.6% next year, so a bit surprised you would turn away from that handsome yield. The companies pre-tax profit and earnings have also now taken a step function upwards having laboured at around £100-110M between the years 2014 and 2017 (and earnings 94-116p during those years), and now at pre-tax of £127M and projected £129M next year, and earnings above 131p. I suppose a more in depth analysis of the $bn product areas they are targeting wouldn’t go amiss, given that they are now starting to sell produced products into selected markets and not just become a materials supplier — there is a world of difference when it comes to value added and margin improvement. Your decision has me thinking of course, because I know you don’t do these things lighty or frequently and it’s prompted me to dig a little deeper from here. I’m looking at Victrex to be in a position to provide exponential growth and to become a multiple share price bagger (horrible term I know). I guess I would make a couple of points; one about the dividend and one about Victrex and its current price. On the dividend, you’re including special dividends. The spare price is 2696p today, the 2017 ordinary dividend was 53.8p, so the ordinary yield is 2%. The 2017 special dividend took the total dividend to 121.8p giving a total yield of 4.5%. The forecast yield you’re talking about probably also takes into account the potential special dividend that management have spoken about. 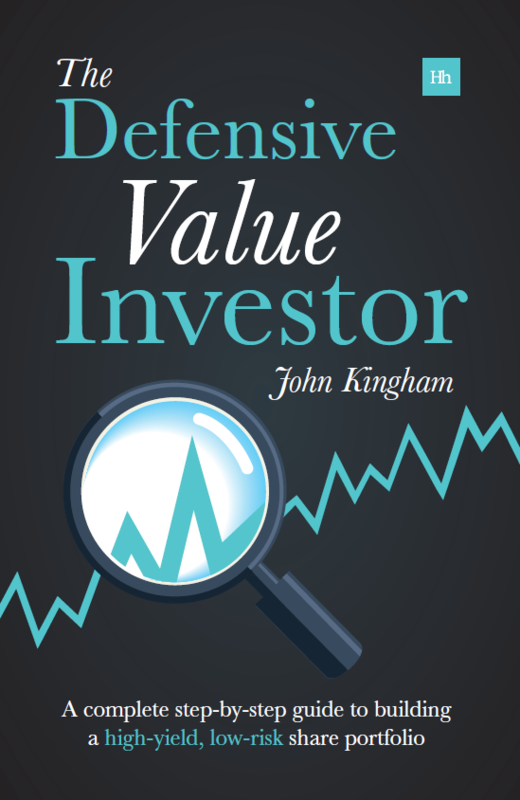 I don’t count special dividends in yield calculations unless the special dividend is regular and has a reasonably long history. 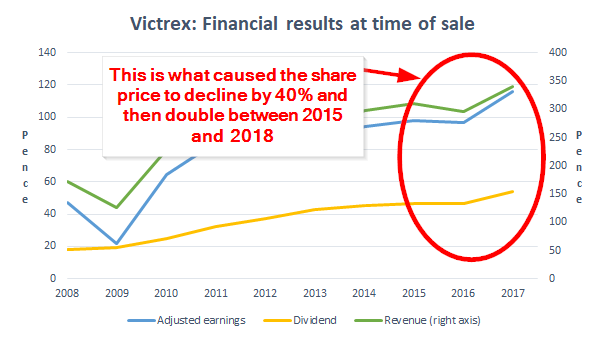 For Victrex, it’s paid a special dividend every other year for the last six years, but that’s not a long enough track record for me to be confident that they’ll keep paying a special dividend in the future. So although the total yield for next year may end up as 4.5%, I’m not confident that it won’t fall back down to 2% or so the year after. As for Victrex’s price, I don’t actually think it’s especially expensive or overvalued. The price is a bit optimistic, but Victrex comes in at number 66 out of about 200 companies on my stock screen. So the combination of growth, quality and price is still comfortably above average. However, there are some companies out there which are very much out of favour, have at least as good a track record as Victrex but which also have lower valuations and a higher dividend yield (not including unreliable special dividends!). So in this case I’m selling a good company at what might even be a fairly reasonable price, in order to reinvest in what I hope is another good (or better) company at a much more attractive price. In some ways I’d quite like to hang on to Victrex, but you have to weigh up the opportunity cost of not investing in those other companies, and I’d rather go where the future risk-adjusted returns are (potentially) highest. Obviously I’m not an oracle, so you are more than welcome to have a different opinion and hold onto Victrex for the long haul! It’s pretty accurate, in fact it’s hard to find many that are in favour just now. Being 30% in cash is giving me a bit of flexibility, so I’m tempted to keep the 1.47% Victrex represents of my portfolio in the sock drawer. I wasn’t being totally up front though, as I also sold some at a higher than today’s price. We just need TED to wake up from his slumber now and DOM back up at 350. Don’t you worry that next month it may not be at an attractive price anymore, leaving you out of two good companies? I know it’s your strategy to trade once a month, and obviously it will work for you some times, but I would find it very hard to not buy at a good price once my mind’s made up. I tend to believe the markets are somewhat efficient, and while there is miss-pricing it isn’t generally for too long. Especially on the downside. That’s a good point. If I had already chosen the company I wanted to buy and then waited a month, that might be a problem. But I don’t have a company in mind yet. What I’ll do is pocket the cash from Victrex (about 3% of my portfolio), sit on it for a month and then look at the market in December to see what’s on sale. By that point some companies will have gone up, other will have gone down, so I’ll just look to invest where I can see the most potential value.